Currently, endless new technologies emerge. If one could map out Science & Technology (S&T)Planning correctly on the national level, innovation shareholders would remain current on technological development trends and occupy a very advantageous position among the fierce future competition of the global market. Thus, to formulate effective S&T planning is significant for a nation, especially for new and emerging technologies. This paper proposes an industry S&T planning framework. 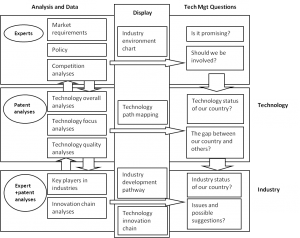 Different from previous frameworks, this methodology’s dynamic is directed up-to-down, tries to find out the key elements in some specific technology area, and aims to aid in S&T planning. China’s solar cells industry is employed as the case study. (1) Research Outline: Following the “Up-to-down” idea, the framework is divided into three levels: Environment, Technology, and Industry. For each level, this paper addresses the specific technology management questions, aiming to reveal the bottleneck for technological development, and to give a reasonable and effective answer by combining qualitative and quantitative analyses to display in the form of a roadmap and/or chart. (2) Data: Qualitative and quantitative analyses are employed. Data for qualitative analyses include literature review and experts’ knowledge. Patent data are used to gauge technological development. For the three levels, these two types of data are emphasized differently based on their respective characteristics. Patent analyses include cluster analysis, comparative analysis, portfolio analysis, correlation analysis, sequence analysis, forecasting, etc. (3) Display Format: This paper communicates findings by mapping or charting. Considering the three elements, the research framework is constructed as per Figure 1. (1) Environment Level: To do strategic S&T planning, understanding the technology innovation environment is the first and most important step. The environment may include the current competitive situation, global and local technology policy, and market demand. All of this information is required to determine whether China should support solar cell technology and therefore pursue S&T planning. In this level, the qualitative analysis, namely the experts’ knowledge, forms the major method of data gathering, and an industry environment chart is employed to show the main factors. (2) Technology Level: Technology is the core for product and industry; thus, this level aims to reveal the current situation of China’s solar cell technology and define the gap between China and the most advanced international level. Patent data are used to characterize status for technology overall, focus, and quality analysis. Combining the results with experts’ knowledge, this section yields the development trends and future direction for China’s solar cell industry by technology path mapping. (3) Industry Level: The key technology management objective at this level is to grasp the current situation of China’s industry production and to find a breakthrough to resolve the core issues. This section aims to find the industry leaders and knowledge-sharing networks, and to analyze the industry’s future direction by watching the activities of major players. At the same time, through in-depth research on the industry innovation chain, this section tries to identify any bottlenecks impeding successful commercialization, and then offer ideas for their solution. Employing the “Up-to-down” industry S&T planning framework uncovers that the future prospects for China’s solar cell are promising, but include major challenges. (1) At present, both domestically and internationally, the prospects of the solar cell industry show forth as promising and broad; thus, an effective S&T planning exercise is indispensable. (2) This study finds that China’s solar cell industry entered the commercialization phase around 2004, which is quite late compared with the leading countries. And, the technology quality is worrying as indicated by patent analyses. (3) This study finds a lack of raw materials, weak R&D ability, and a small domestic market to currently present problems for China’s solar cell industry. Possible solutions include, for example, encouraging new types of solar cells to avoid dependence on silicone, and encouraging cooperation between industry and academe to improve the technology.